Please don’t call my kids "the twins"
Do you mind not calling my twins “the twins” please? 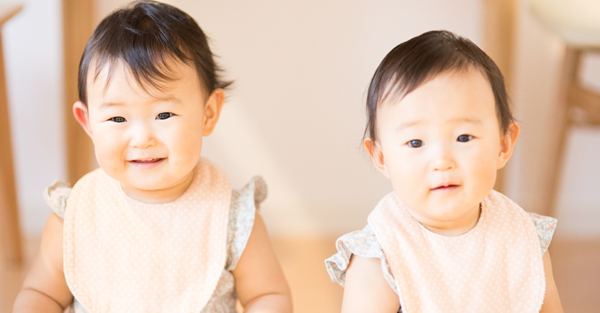 Experts agree that using twins’ first names is important to help them develop their own senses of individuality and self-esteem. Pinkie-swear I’m not. We’ve never called Estelle and Georgina “the twins” because they looked so different from the moment they were born that it never occurred to us to treat them as a unit. They’ve always felt more like two completely different babies who were womb-mates for 36 weeks than like two of a kind. So, when I was doing research for another article I was writing a few months ago and I fell upon this piece of advice, I patted myself on the back for nailing it by pure chance. One small win amid a sea of parenting eff-ups. Oh, and another thing. Do you mind sometimes saying “Estelle and Georgina” and other times “Georgina and Estelle”? The lab coats say that varying the order of the names prevents one twin from feeling like they’re second-best. Since I’m on a roll, let’s talk about comparing twins. I know it’s hard not to analyse every aspect of their appearances and personalities for similarities and differences, but it’s not ideal for them in terms of developing their own identities. The comparisons are even worse when it comes to their personalities. Georgie recently went through a phase where she was petrified of the wind, the rain and waves at the beach. Whenever a slight breeze would start blowing, she’d shriek loudly. It made any social encounter very difficult for a while. But you know what made it worse? When people would say, “Oh, she’s the sensitive one.” Um, no. She’s just going through a phase as all kids do, so let’s not draw broad conclusions on her personality based on a couple of incidents that happened when she was two. In fact, this piece of advice goes for all kids. Let’s not point out their character traits in front of other people – especially negative ones. It’s humiliating and can leave deep, lifelong scars. I’m sure each one of us can remember an incident from our childhood where a beloved uncle laughed at us when we pronounced a word wrong or a family friend declared us shy. It can be damaging, so let’s not do it to innocent kids. With twins, those types of judgements and micro-humiliations happen all the time because they’re constantly being compared to someone else. Statements such as “I can tell she’s the stubborn one!” or “She seems more reserved” make them feel like they’re too much of this or not enough of that compared to their sibling. Even a positive comment like “She’s so outgoing!” can make the other twin feel like a lesser version of her shiny sister. I recently realised that I was so resistant to treating Georgina and Estelle as a unit that I’d forgotten to explain to them that twins were something special and unique. In fact, I realised with horror that I’d barely used the word “twins” to describe them at all! Thankfully, my hubby admitted that he’d been talking to them about their special bond for a while, so he picked up the slack on that one. Because despite all the downsides of treating twins like two peas in a pod, there are so many beautiful aspects of twinhood. They always have a playmate on hand. They have their own language and inside jokes. They handle transitions more easily because they always have their twin to turn to for comfort. They have a BFF for life. So, I can’t neglect to celebrate their bond because of my concerns and I have to remind myself that they’ll ultimately be the ones to decide how they want the world to address them. For all I know, they might end up being dubbed “The Twin Terrors” by their nursing-home mates when they’re 95 and rocking identical purple hair.